Scottish crime writer Chris Brookmyre was the big winner on the opening night of the Theakston Old Peculier Crime Writing Festival in Harrogate, as he nabbed the Crime Novel of the Year prize for BLACK WIDOW. In a rare double, last September Brookmyre had also won the McIlvanney Prize for the same novel. Following the win, congratulations have flowed in from around the crime writing world for a novel that has been described as "brilliant" and "a belter of a book". BLACK WIDOW is a story about cyber-abuse, where "even the twists have twists", said the judges. It features Brookmyre's longstanding main character, reporter Jack Parlabane. Talking afterwards, Brookmyre said that he was glad the winner was announced as 'Black Widow', rather than 'Chris Brookmyre', as it is all about the book, not him. It's the first time Brookmyre has won the Theakston Old Peculier Crime Novel of the Year, though he is a previous finalist. "I'm really quite taken aback," he said. "I've been shortlisted three times before... always the bridesmaid, today I get to walk up the aisle. A book is not just the work of the author behind it. I'd like to thank my editor, Ed Wood, for his calibre and daring that made a good book greater. I'm mainly just very proud." Susie Steiner's MISSING, PRESUMED (The Borough Press). 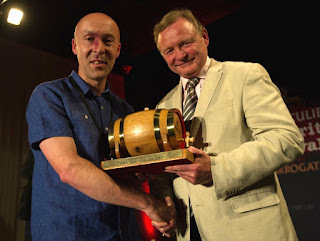 Brookmyre received a £3,000 cash prize and handmade, engraved oak beer cask made by Theakston Old Peculier (photo above of Brookmyre receiving the award from title sponsor Simon Theakston). On the opening night of the festival, a special presentation was made to Lee Child, the winner of the eighth Outstanding Contribution to Crime Fiction Award. Child joins Val McDermid, Sara Paretsky, Lynda La Plante, Ruth Rendell, PD James, Colin Dexter and Reginald Hill as recipients of the Award. Agent Jane Gregory was also honoured with a a Special Contribution to Crime Fiction Award, given by author and co-founder of the Festival, Val McDermid. The Theakston Old Peculier Crime Writing Festival is being held in Harrogate this weekend.